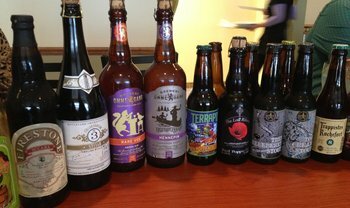 Tonight was beer club, a gathering of beer minded individuals from my work who get together about once a month at a local BYOB for good company and libations. As per usual, a good turnout, with a good representation from the core team, but also some very welcome new faces. About half of us are, at this point, avid homebrewers, so discussion veered into a rather nerdy realm from time to time, but that's all good, and there was also a nice contingent of non-beer drinking peeps who were bemused by our nerdery, but steered the discussion other ways as well. Good times had by all. Chimay Tripel (White) - A beer I've obviously had many times before, and it's just as good as ever, though I seem to have veered away from a lot of the Belgian styles that initially hooked me on good beer. Still, this is a nice one. I'd probably downgrade to a B+, but it's still very nice. The Captain's Brew House All American - This is actually a buddy's homebrew, and I arrived a bit late, so I only really got to try the yeasty dregs of the bottle, but it seemed pretty darn good - easily the equal of the previous beer. Would like to try it fresh sometime. Still, truly a beer worthy of Captain America (i.e. the namesake of my buddy's home brewery). The Captain's Brew House Shameless IPA - Another homebrew, this one is actually a Northern Brewer Dead Ringer. It was very good, with a big malt backbone, but also a nice hop character. I'm not a huge fan of centennial single hopped IPAs, but this one was solid. Kaedrin Dubbel - My homebrewed dubbel continues to evolve, with an almost coffee-like character emerging right now (but not straight coffee, and not really a roast either, somewhere perhaps between those flavors). It's actually quite interesting. 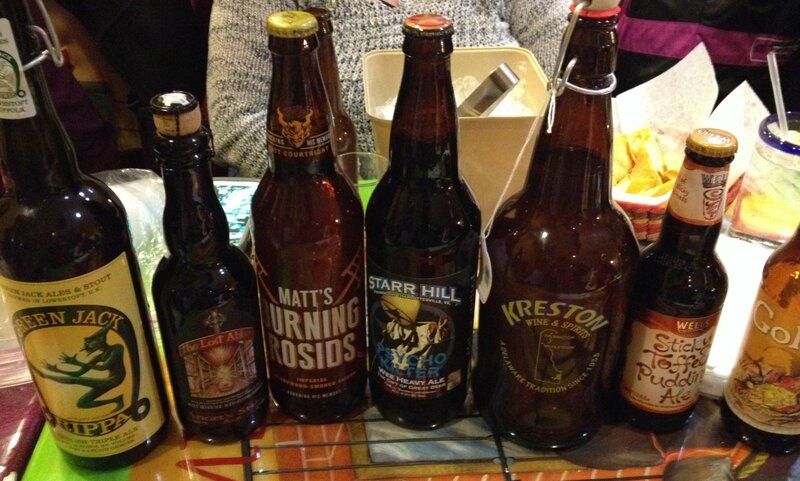 I'll be interested in trying this again in isolation, as beer club isn't exactly the best setting for my palate! Trappistes Rochefort 8 - Truly a classic beer, one of my favorites of all time. Previously reviewed. Starr Hill Double Platinum - A solid, if a bit boozy DIPA. Nice hop character, but the booze was more prominent than I expected for an 8.5% ABV beer. It was probably a little warmer than it should have been, but I'll leave it at a B for now. Lost Abbey Red Poppy - Another of my contributions for the night, this is still a spectacular beer, and made a lot of waves with the attendees, even folks who don't normally go in for "beer". Previously reviewed, and still an A in my book. Firestone Walker §ucaba - Very generously contributed by Kaedrin friend Dana (she's not a huge bourbon fan, but knows that some of us other beer club members are), this sucker is as good as ever. Previously rated and still an A in my book. And that just about wraps up this episode of Law & Order & Beer. Fortunately, all As and Bs, so no District Attorneys needed. See you next month. This page is an archive of recent entries in the Starr Hill category. Spring House is the previous category. St. Bernardus is the next category.